Isparta starts out as a juicy red rose. Sniffing it conjures to mind the experience of biting into a delicious fondant rose filled with berry compote, and if that doesn’t sound attractive to you, then I don’t know what will. At this stage, this rose perfume is also reminiscent of other roses, namely Malle’s Portrait of a Lady, capturing the tartness of Dominique’s Ropion’s masterful raspberry rose accord, and Dior’s Oud Ispahan, drawing a parallel with the smoky rosewater of Francois Demachy’s ultimate rose and oud combination. Think of it as a happy hybrid of the two. With time, the gourmand sensibilities of the opening subdue, making way for a much smokier and more intensely woody affair. There is a touch of something animalic too, something that is reminiscent of the oud-like cypriol found in Dior’s Leather Oud (and Oud Ispahan for that matter). This little ‘animal’ inflection, with its leathery smoke, is a nice touch that compliments the sweet, dewy quality of the rose to create an ambience that is deeply resinous. Perhaps the most impressive element of Isparta is its sense of restraint and balance, a feature that should be highly lauded when Guillaume’s fondness for heavy gourmands is taken into consideration – he is, after all, the gent that gave the world Musc Maori (a.k.a Eau de Nesquik). As it settles into the base, what remains of this hybrid red flower is a nicely proportioned (and rather robust) bed of oud and incense that exudes gorgeous red threads of fruity rose. Do I love Isparta? In short: no. That said, I do like it quite a bit and I also think that it’s a very well executed rose. If I didn’t have a bottle of Portrait of a Lady and a calculated stash of Oud Ispahan decants, I would most definitely consider a purchase. For now though, I’m happy to file it under; “if a bottle landed in my lap I wouldn’t complain” and it is fair to say that I feel more fondness for it than the brand’s other rose (Brulure de Rose), which I’m really struggling to make my mind up about. Thumbs up for Pierre, but I’ll keep looking for ‘my’ PG scent. 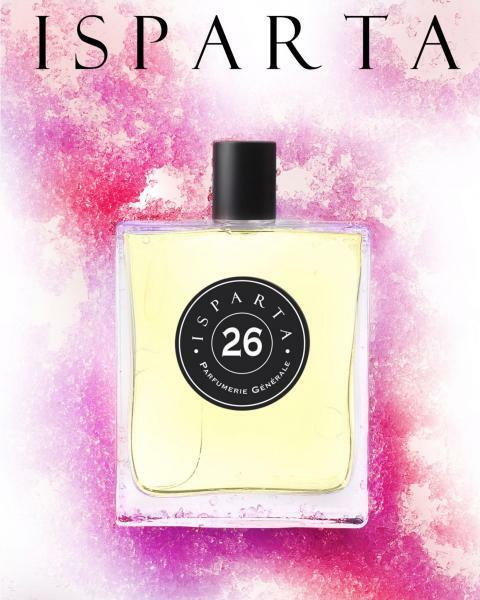 Parfumerie Générale’s Isparta 26 is available in 30ml, 50ml and 100ml Eau de Parfum. Quotes, notes and images via parfumerie-generale.com. Posted in Parfumerie Générale, Perfume Reviews, Rose, Unisex, Woody and tagged Isparta, Isparta PG26, Parfumerie Générale, Perfume Review, Pierre Guillaume, Rose, Unisex, Woody. Bookmark the permalink. Have you tried Phaedon’s Rouge Avignon? I’m wondering how that other recent fruity, musky, dark rose by Pierre Guillaume compares with Isparta. I have not (my exploration of the Phaedon line is pretty limited, unfortunately) but now that you’ve mentioned it, I too would be interested to see the similarities. I’m really keen to try this as it sounds right up my alley. If it’s in any way a cousin of Portrait (but at a lower price point) I’m keen. Plus I really like his PG work. Have you tried L’Ombre Fauve? It’s a killer amber in my opinion. It is definitely a good alternative for Portrait of a Lady and the price is much more attractive. I’ve probably tried L’Ombre Fauve but can’t recall it. I’ll have to sniff it again. Looking at that note list no wonder Isparta smells similar to PoaL what with the red fruits, rose, patchouli and incense. You’re right, there’s no need to own both. “Eau de Nesquik” made me smile! The notes are very similar. It’s very PoaL in the opening and more Oud Ispahan in the base. With Isparta, tho’ not yet sniffed, it’s the first time Pierre’s kinda disappointed me, as I’d much rather he’d just avoided the whole rose+oud ‘bandwagon-hopping’ quite frankly. (& especially so if it’s indeed so derivative). Suppose it was just too irresistible/inevitable he’d finally cave. Arabian Horse certainly sounds interesting. I’ll have to seek it out. We’re definitely at opposite ends of the spectrum when it comes to PG. I do really admire his work but nothing has me rushing to buy it. That said, Djhenne really does tick the boxes. Funnily enough though, I found an intriguing work of his when at Bloom recently – L’Eau de Circe, which is just a richer version of Gucci Rush!